Bringing home your new mini pig is such an exciting time. The first few weeks are filled with getting to know your mini pig, training her, and enjoying her curiosity as she learns about her new home and family. It’s also the time when you start bonding with your mini pig, building up the love and trust that will last a lifetime between you and your piglet. Mini pigs are generally slow to love and trust, so bonding with them requires time and patience. Unlike puppies who often love and trust immediately, mini pigs can take several weeks to even months before bonding with their new owners. The bonding process can take even longer for a rescue pig coming out of a negative environment. However, pigs can form incredibly strong bonds with their owners, making the time and effort spent worthwhile. The best thing you can do to prepare for bonding with your new mini pig is to set your expectations. For us, the first few weeks with Oscar consisted mostly of going through the motions of feeding him, taking him outside, and trying to pick him up without him squealing. We focused most of our efforts on basic care and helping him feel safe and comfortable at home. The biggest bright spot was that Oscar would nap on us if we picked him up and placed him on our lap, so we cuddled with him as often as he allowed. I don’t remember exactly when we felt bonded with Oscar, but it was at least a month after we brought him home. Oscar used to stand on one side of his play pen and then run across to the opposite side when I tried to pet him or pick him up. It was really frustrating! Setting your expectations and preparing for a slow bonding time will also help you avoid frustration. With Oscar, I felt like I was doing all the right things, including giving him treats, cuddling with him, and spoiling him, but after a few weeks I started to feel like he just hated me. He wouldn’t come to me, seemed indifferent toward me, and was still squealing a ton. I took it personally and got offended because he didn’t want to be near me. A few weeks later, he came up to me while I was sitting on the floor, climbed in my lap, and went to sleep. It was completely out of nowhere, and I realized all of my previous worries were silly. He simply needed more time to build trust before bonding with me. Now he squeals when he can’t climb in my lap! It’s important to let the bond with your mini pig form naturally and in the pig’s time. You might not even be able to pet your mini pig at first, and that’s okay. Spend some time sitting on the floor and let your mini pig come to you. You can offer your pig some treats or toys and see if she will approach you, but make sure not to force the bond. For the first few weeks, go ahead and give your mini pig extra treats, belly rubs and scratches, and cuddles if he will let you; use this time to bond and you can adjust your behaviors once your mini pig feels safe. Oscar letting me cuddle with him on one of his first few days at home. If you have family members or friends over to meet your new mini pig, it’s useful to set your expectations there as well. We were excited to have our family meet Oscar, and I expected everyone would love him as much as I did. However, Oscar was too timid to approach new people at that point and, when a few family members were brave enough to try to hold him, he squealed and scared them. When the visit ended, I was really disappointed that they didn’t see in Oscar what I saw, but I had my expectations all wrong. I forgot how overwhelming it was to meet a young mini pig for the first time and how long it took for him to approach me. People are so used to dogs with their quick love and happy greetings, and meeting a mini pig is very different. After several more visits with the same family members, Oscar is finally starting to approach them and they are warming to him but it’s been a really slow process. Even though I did my research and thought I was prepared for a slower bonding process with Oscar, I still went through periods where I thought he didn’t like me or would never bond with me. It took longer than I thought and I was frustrated frequently because Oscar wouldn’t approach me or would run off when I tried to pet him. Once we bonded though, I was overwhelmed with how wonderful it felt. To know that he finally felt safe and secure with me was a great feeling, and it was worth the wait. If you’re frustrated and worried that your mini pig hasn’t bonded with you, hang in there. You will get there, and it will be so worth it! Once bonded, you will have a happy and secure pig! Thank you for this blog! 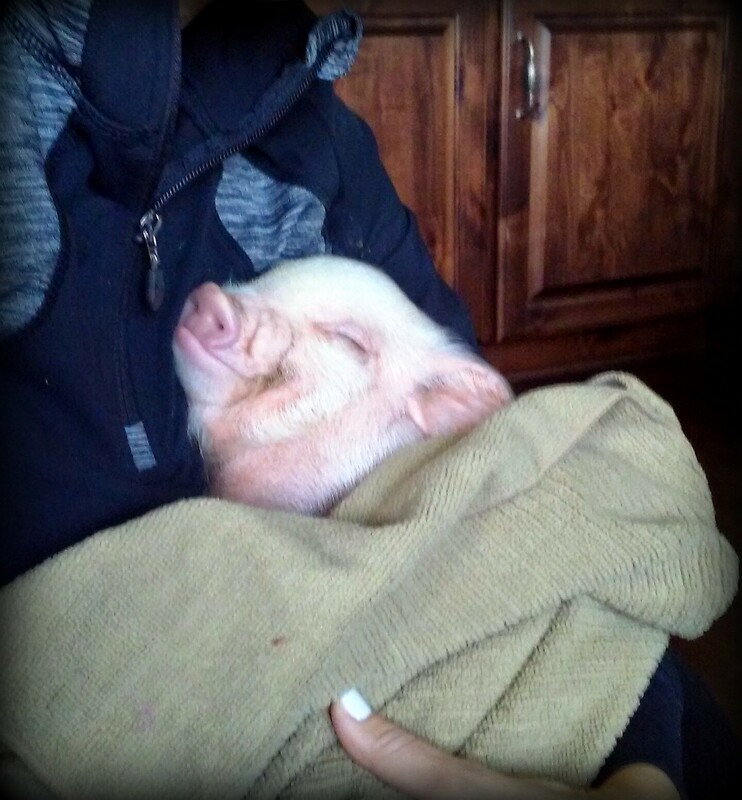 I just brought our new piglet home 4 days ago and I’ve been dying to find a place for good/first hand experice. I needed to hear this! Especially about bonding time! Thank you thank you!! Thank you so much for letting me know the blog has been helpful for you! Congrats on bringing your new piglet home. 🙂 In my experience so far, the first month or so is the toughest. I had plenty of moments when I thought Oscar just hated me before we finally bonded, so don’t worry if you happen to have similar moments. If you have any questions, feel free to let me know. Thanks for the nice comment! I brought my new pig home last night and she is already starting to follow me through the house and gives me kisses before bed. But when I pick her up she squeals so loud but other then that she plays and wags her tail alot. She loves grapes too. I know it will take Blu awhile to adjust to us but do you have any helpful tips. The People who we got her from has leash trained her but i can’t seem to get the harness on her and im scared if I do get it on her and take her outside she will run. What can I do? Hi Kaylyn! It sounds like things are going well so far with Blu. For the harness, I recommend giving treats while putting her harness on. It won’t make the process easy, but it should help get her more excited and less reluctant about the harness. I’ll link to our video below on putting a harness on your mini pig, and hopefully that will help. One thing you can try with the leash is to put her harness/leash on and then just let her wander around the house. This will help her to see that the harness and leash are safe and not just see them as confining or relate them to loss of freedom. Sometimes we put the harness/leash on and then start pulling them around right away, and they can resist that. If Blu gets a chance to just roam freely in the house with her harness/leash on, she might learn to be more comfortable. As for picking her up, just keep at it. Oscar used to scream his head off every time we would pick him up. We kept at it, and he eventually calmed down. But, it took at least weeks to a month of holding him several times a day before he was comfortable being held. Hope that helps! Now when I put her harness on she slips her front legs out and gets stuck and freaks out. If your pig is squealing when you pick her up, it might just be because you’re holding her wrong. They don’t like they’re back feet dangling. Make sure you hold your hand under her feet so she feels secure and doesn’t feel like she’s hanging there. There are videos on youtube that show you how. Hi Ashlee! We had a similar situation when we first brought Oscar home. I’ll link below to my first post, and I imagine you’ll be able to relate to it. If you haven’t already, I would try giving her a small space all to herself where she can get adjusted and start to feel more comfortable. You can go in and try to give her treats and just sit with her, but let her kind of work at her own pace and try not to rush it. Pigs are very different from dogs when they first come home and take a while to adjust and trust, so it can be weeks or months before she’s really comfortable. On the bright side, you’ll have small victories along the way and should see improvement, but it just takes time. She’ll get there! Hi! Thank you for the info, I just got my piglet and its been really hard for both of us. I try to make her feel safe and I was starting to think maybe she didn’t like me. But I really needed to hear this, I was used to Puppy love and how they approach to you so easily. But I will hang in there until we bond, I really care for her, and I want her to feel safe and loved. Hi Sarah! Thank you so much for letting me know the bonding article was useful for you! I feel your pain; Oscar LOVES my husband. My husband helps out when he can, but I am home with Oscar more so I do a lot of the caretaking (similar to what you mentioned…feeding, brushing, and spoiling). When my husband gets home, Oscar cuddles right up with him. Sigh. On the bright side, you will eventually form your own bond with your little guy and it will feel rewarding. When you can, stop and take some cuddle time with him, even if just for yourself. I found all of the new daily tasks, squealing, and frustrating to be exhausting for the first month or so, so taking some time to cuddle with him will help you refresh and help you get through the tougher times. If you feel like you’re just going through the motions right now, that’s completely normal in my experience. Your little guy will get there, and you will eventually bond and enjoy your time with him much more. Keep me updated on how things are going if you think of it! Hi I’m interested in purchasing a mini pig. But I was curious to know about how long can the pig be left alone without it destroying things or becoming restless? Is there anything we can do to increase the amount of time the pig can comfortably be left alone? Thank you. This post really got to me. I just got my pig a few weeks ago and I seriously felt like she hates me. She is an outside pig and so it’s hard me to spend as much time with her as I’d like. I currently live with my parents so bringing her inside isn’t an option sadly. I really want her to bond with me and love me. Thank yous o much for this awesome post. It definitely helped! 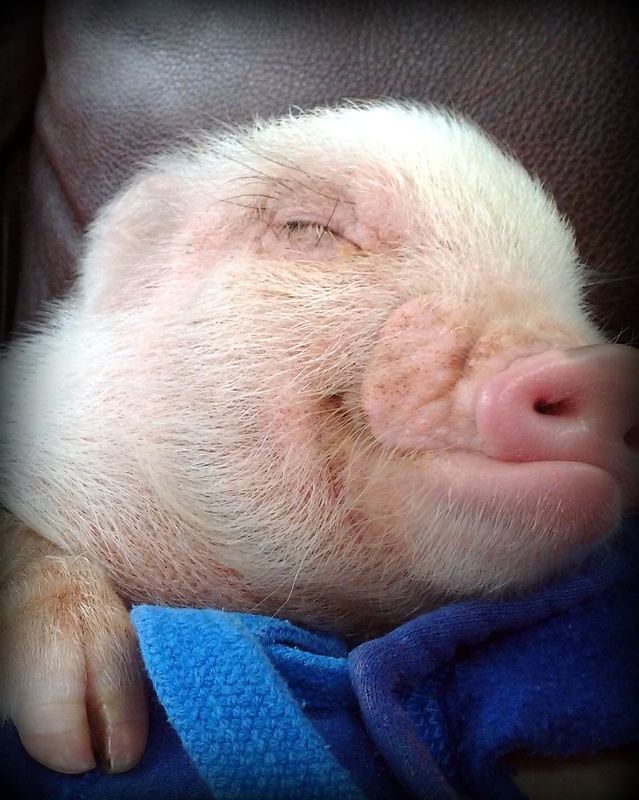 I just bought my piglet home. She let us hold her but after the car ride home we put her in a playpen and she squeals when we try picking her up. Play pen works really well inside the house. She naps alot. Loved this article! We just got our pig a couple of days ago and I can barely get him to stay still to even pick him up. He squeals so much when we pick him up to take him out or bring him inside. This article makes me feel so much better, I know I’m not alone! So thank you for making my day 🙂 I can’t wait to have the bond with our baby like you do with Oscar! Thank you so much for your very informative blog! I, too, have just brought home a new mini pig and as much as I thought I was prepared and well researched, there are just so many surprises! Oscar is adorable and is just like my Otis in so many ways! Toys and treats have been the most tricky for us because he seems to hate everything but luckily I feel we are really starting to have a strong bond after only a couple weeks! Looking forward to hearing more about Oscar! I absolutely love this blog! I think I’ve read everything you’ve written in preparation of bringing home my new piglet in 5 days! The only concern of mine is that I have my bedroom gated off from the rest of the house and plan to keep him in there along with food, bed and a litter box for the first several months. As he gets older I will let him have access to more of the house and eventually move the food to the kitchen, and litter box outside (ideally). He’ll be 8weeks old when I receive him. Should I have a smaller enclosure for him (say when I leave the house) or will a small room be fine? I noticed that you had a play pen for him… I can’t decide what would be best! Thanks for your blog! I have a 8 month old mini pig named Harley. He is a rescue pig. He now is leach trained pot trained.when he trays to bite I tell him no and use a spray bottle.then he gets loving. Can’t get him to sleep next to me yet.he’s both indoor and outdoor pig. I’m having a similar issue. I brought Sampson home 2 days ago and quickly had to go back to work. I have a pen set up for him but it breaks my heart to leave him in the morning. The breeder said to leave him in the pen almost all of the time, except for supervised outings until he adjusts. The part that breaks my heart is the squealing.. he does it even in his pen by himself. I worry that he just squeals all day while I’m gone. Is this normal?? Just got mine today, this is very helpful thank you! Hi I just brought home a 4 month old piglet and I’m very worried that she won’t bond with me do to the fact that she was not handled at all by her previous owner.. She squeals every time I try to hold her and she only seems like she feels safe and content inside her cage we brought her home in. When I take her out of it she runs right back to it. I’m afraid she is to old to trust me.. Can you give me some pointers that may help my precious little girl feel more at home? Hey 🙂 My girlfriend and I got a potbellied piglet about a month ago. She’s about 3 months now and nice and healthy and a little chubbo, but we love her so much. She’s really loving and even sleeps in our bedroom now either in her bed but mostly in ours with us. Well the reason I’m writing this.. she isn’t really affectionate towards me. I feel like she likes my girlfriend a lot better even though I’m the one putting in all the work ( feeding, clean-up, leash training, and so much more) Qué is very loving towards her and always gets excited when she’s around. For me she’s only excited when i have food. She’s accepting of belly rubs and petting when she’s tired or during bed time but whenever i try to cuddle she snorts really loud like she doesn’t want me in her space. She doesn’t listen when i call her but when she does then Qué comes running. Im sorry.. I’m a little heartbroken because i love her a lot but for about 3 weeks now its like I’m only there for food or entertainment when I’m her only option. i just want her to fell the same way about me. And she barely even trusts me. I don’t know what to do. I know it can be really heartbreaking, but I do think it will get better. I go through phases with Oscar and have times when he seems to like me and others when he’s just in a funk and definitely doesn’t seem to like me (but adores my husband). I know it sounds empty now because it’s so frustrating, but I really really do think it will get better! Hi Alexander! I feel your pain because Oscar is the same way but with my husband. I feed Oscar, take him out to potty during the day, take him out to root and play, give him treats, am home with him all day, but Oscar definitely prefers my husband. For me, I suspect part of it is that I’m doing a lot of the disciplining since I spend the most time with Oscar, and I think that’s caused some of the issue. At the same time, another potential problem is that my personality is not as firm as my husbands. I love nurturing Oscar and would do just about anything for him, and pigs work off of respect and hierarchy. I think there’s a level of respect that Oscar maintains for my husband that I don’t get because I can come across as “weaker” which pigs can take advantage of. I have no idea if that’s something you can relate with, but I thought I would throw it out there just in case. Que is still young, so just continue what you’re doing with caring for her and loving on her but, once she’s comfortable at home and with you, it’s also important to make sure she knows you’re in charge. Again, this may not be an issue you’re dealing with, but we’ve run into some Spoiled Pig Syndrome with Oscar, and I wish I had been more firm with him when he was younger. I’ll link below to my post on that because it’s hard to explain here, but the post will explain my point much better. This won’t really help you fix the problem, but I’ve honestly accepted that Oscar likes my husband more than he does me. But, at the same time, I have a different relationship with Oscar than my husband does. I spend a ton of time with Oscar, I make sure he has what he needs during the day, I do most of his training and grooming, and basically all of the things that it sounds like you’re doing. Even though it won’t feel like it now, Que will come around more as she gets older (Oscar didn’t approach me completely on his own until he was about 8 months old…), and it will get easier. Hopefully your situation improves and is better than ours but, if not, take some satisfaction in the work you’re putting in and know that, whether it seems like it or not, Que relies on you and either does trust you and doesn’t show it well or will learn to trust you and know that you are always there to care for her and feed her. Also, you might already be doing this, but stop during the day and take time to just play with her and cuddle with her and enjoy her. I get so busy during the day taking care of Oscar and getting other things done that sometimes I forget to stop and play or cuddle. I make sure Oscar gets time with my husband in the evenings, so I try to back off a bit but then forget sometimes to take my time just hanging out with Oscar during the day. Even if it’s just sitting with her and giving her treats, make sure you’re getting some fun time in with all of the work you’re doing with her on her leash training, clean up, etc. I forget to do that sometimes! I hope things improve and I think they will to a certain extent. Even if things never change and Que always seems more loving toward your girlfriend, don’t forget that your relationship to Que might be different but is just as important and I think you’ll start to see that more and more as Que gets older. Hope that helps some. OMG thank you for writing this! I brought my little guy home last night and I had a mental breakdown, tears and all because I thought that he didn’t like me. I got so scared and I’m having a hard time getting the confidence to try and pick him up. I was wondering how you got over that initial fear and what you did. Also, how did you learn to pick him up without squeeling. And George(my pig) lives in a baby play pen. I mad that his little spot. So I was wondering would me just sitting on the floor next to him just doing my own thing and letting him get used to me just being outside of his cage and being around me would help? Thanks again for the help and for this amazing blog. Hi Tess! Ah, I’ve been there with the tears and the breakdowns, so hang in there! The beginning when they are so scared and new to home can be really tough. You are right on about just sitting on the floor next to him and being near him. It can be easy to try to rush the bonding process, but I think it’s better to let George come to you when he’s ready. It might take a little while, but he’ll start getting more comfortable and start learning he can trust you. As for picking him up, I’ll link below to our video on it in case you haven’t watched it yet, but it’s a training process and also just takes time and practice. If you can and don’t need to lift him right away, you might wait a little bit to get him more adjusted to home first. But, once it’s time or once you need to pick him up, my best advice is to decide how many times you want to practice picking him up each day and just take a big deep breath and do it. For us, we had stairs we didn’t want Oscar trying to go down, so we had to pick him up to go out to potty. I’m kind of glad that was the case because it forced us to pick him up several times a day even when we didn’t want to. I really do think the beginning is the toughest with trying to socialize them, training them to be picked up, and trying to get a harness on, so it does all get easier. Hope that helps! On the training and tricks, I think you can start whenever your pigs seem ready. Give training a try and, if your pig is receptive and seems ready to learn, then keep going. If your pig doesn’t seem ready, then hold off and keep trying at different times to see when a good time is. Oscar was ready pretty young and always enjoyed his training times. I don’t recommend a collar for pigs due to their necks, but many people use harnesses. Personally, I only keep Oscar’s harness on him when I’m with him, since his harness can slide around or get stuck around his belly and scare him. So, when I’m with him, his harness is on. When I put him in his crate or when I’m not watching him, I take his harness off. If you want to try taking your pigs on walks, I recommend using a harness. 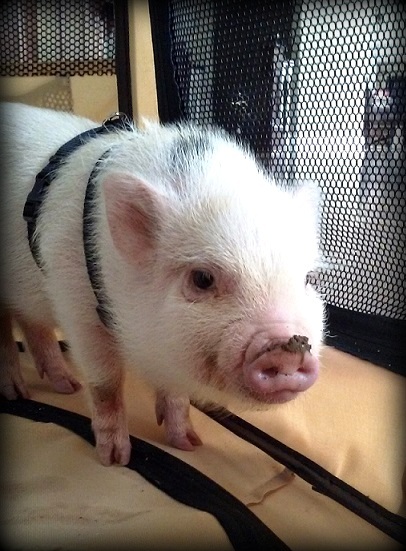 Here’s a link to the kind we used for Oscar when he was young: http://lifewithaminipig.com/how-to-put-a-harness-on-a-mini-pig/. You can definitely try giving your pigs a bath. Some don’t mind baths but others (Oscar included) hate water. Some of the scent you’re experiencing could be from their hormones since they aren’t spayed/neutered. Intact males, in particular, have a strong, unpleasant scent. But, if you can get your piggies to take a bath, it will help with some of the smell. I wouldn’t worry about a litter box with your piggies being outside. Oscar only goes potty outside, so we don’t use a litter box for him. Oh yeah, btw, my piglets are 4 and 6 weeks old. Binky, the little girl, is the 6 week old, and Hamilton- the boy- is 4 weeks. Hi I’ve been reading a lot of your info on your lil oscar I just brought home a 9 week old mini pig yesterday and he’s not wanting anything to do with me I can’t even go around the cage or think about picking him up when I try he jumps so I jump I know you say it can take weeks but do u have any suggestions I can do to show him I’m not gonna hurt him that he’s my lil buddy I’m keeping him as an inside pet so any ideas would be greatly appreciated I just wanna cuddle with him Thanks so much !! I just took in a mini pig that was recently in another home. I did my research I learnt what she needed and how to react to her behavior however I wasn’t prepared for how distant a pig can be. She doesn’t let us approach her much without food, she bites at our dogs and she screamed a lot especially the firsts day. I know adjusting to a new home and coming from a crappy home prior is a huge adjustment but I honestly feel like shes never going to adjust. It’s so hard to have hope when she always seems like we are doing something wrong. This post was absolutely refreshing to read this and gives me hope. I want so badly for my little pig to adjust to us and our other fur babies, glad to know we are not the only people going through this. Hi Hayley! I’m glad the post helped! This is a tough time in the beginning, and especially when your pig came from another home. But, you did a good thing taking her in, and she will eventually learn to trust you. It really does take time and can get frustrating in the process, but one way to look at it is the bond kind of just continues to grow with time. Even now that Oscar is a bit older, I still feel like he grows to trust us more with time. We’re in a good place and he will approach us, but the bond gets stronger the longer we have him and love him and work with him. So, try not to let it get you too down on the harder days, and focus on the little moments of progress. You will get there with her! Hey! I recently just got a little pig and she is two months old. Her name is Millie. This is our 3rd day having her and she still hasn’t really warmed up yet. She knows to use her litter box when she is in her room but as soon as she gets around the house, she pees and pooped on our rug in the dining room. She is very good about letting me pet her but she won’t come to me nor will she let me pick her up. Do you have any advice for me? Hi there! I love your site, it’s so informative. We have had our mini pig for 2 weeks now and she seems to hate me haha. We started her off in the bathroom to help potty train her in there and now we take the baby gate down all day and she won’t leave her area. I thought maybe because we have hardwood floors because she has a really hard time walking on them and gets scared and pottys herself. But she stays in her area and is now a bathroom pig haha. She wags her tail when she sees me and let’s me pet her if she’s in her bed but if she’s walking around the bathroom and I walk towards her she runs away from me. I have no idea what to do. I’m so sad and feel like I somehow screwed this up. Should I hold her more and make her be by me or just let her be? And what do I do about the wood floor. Literally my whole house is wood except bedrooms and I don’t want her to potty in there. Please give me any advice you have. Thanks! an hour and just petted her but after I put her back down and she just ran away terrified. Should I continue to catch her everyday and hold her or just let her come to me? Sweetie it takes a bit for a pig used to you It’s all new to them and they don’t take change very well Just relax and let her come to you Sit on the floor and let her feel comfortable She’s scared and takes time to trust But once they do it’s on I have 3 pigs and they are amazing loving The best pets I’ve ever had !! Be patient she will come around and enjoy she will love you so much once she’s able to trust you !! This blog has been so helpful! I brought our mini pig home 3 days ago and she’s 4 weeks old. She has been very timid and scared of us. And everyone wants to come see her and hold her, but she squeals so loud, they are scared of her! (She made a young child cry!!!) I love her so much, and I hope she warms up soon!! Thanks for all your great info! It’s good to know I’m not alone! Hi i got my mini pig Lola a 2 days ago and she is so sweet and shy she gives kisses all the time but when it comes to me trying to hold her and pick her up she screams amd squeals so loud. Do you have any ideas i can do to get her closer to me? By the way your blogs have been so helpful.☺ It is so good to know im not alone. I just brought my mini pig home yesterday. She shakes but when I coo to her, her tail wags. Of course she won’t come to me yet. But could this just be because she is still scared and not familiar with her new house yet? This article was very helpful but, was wanting to know if you had any tips on eating. Ms. Piggy is 2mths old and wasn’t socialized very much. She has yet to eat. Should I be concerned? We just got a mini pig yesterday we let her come out of the carrier in the backyard but now she wont go back in or come in the house. She comes to us but wont let us hold her or pick her up. How do we get her in the cage to bring her inside?? Please help! We are enjoying the first week home with our new piglet. My kids are absolutely in love with him and hes already eating out of their hands❤ he naps on my lap or curled up really close to my husband but doesn’t trust the kids for nap time just yet. The only issue we are having is the potty training any advice?? Looking forward to reading more! Thank you! It takes time for a pig to be able to trust you It’s a new place you’re new to him so Patience The best way is to get down on the floor with the pig and let him/her come to you Offer some treats they love Cheerios Have the piggie come to you and soon will start trusting you more and more everyday!!! Also if the pig is small I’d start trying to put the harness on them now so that way they get used to it and will be a lot easier on you put lots of Cheerios on the floor in front of him/ her and than put it on Will take several tries lol I have 5 piggies and they are the smartest pets ever Good luck I’m here if you ever have any more questions!!! I’m glad that you mentioned how it can really take months for a mini pig to bond with its owner. I have been wanting to buy a mini pig, and I was wondering how trusting they were. I can see how it would be good to stay gentle and patient when trying to bond, so I don’t elongate the process. Hi, your blog is so very helpful! I just brought waylen, our 4 month old piggy home and it seems like by the end of the day I’ve got him pretty used to me being in the pen with him and talking to him and petting him(unless it comes to sunscreen, he acts like your killing him) but then I the mornings it seems like we are starting from square one and he has forgotten everything from the previous day I know patience is the key, but I guess I’m wondering if because we got him at 4mo old it will be more difficult for the bonding? Hi. 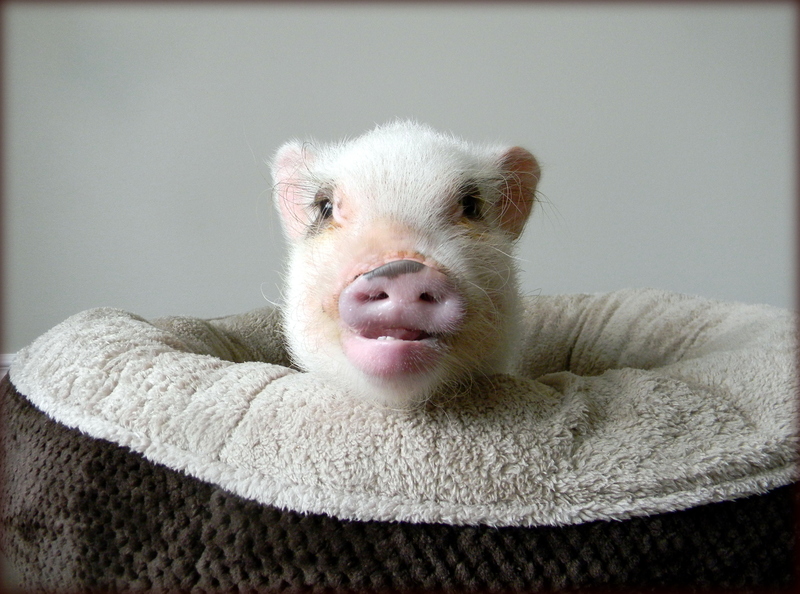 My mame is Denise and I just brought home a mini pig for our family. She will follow us around but when you try to hold her she goes crazy and screams and gets squirmy when you try to approach her to per her. Any ideas on what I can do. This arrival gave me hope, although I feel most the comments came from people who got their piglet’s as babies. We got pura from what I felt was a bad situation, some teenagers had her and they said their dog hair wouldn’t get along withbher, when we got her she hat scratches and bite marks and seemed to have extremely dry and flaky skin. When I picked her up she panicked as they shoved her in a crate so small the door wouldn’t close. I didn’t say anything I just wanted to get her out of there. She seems to be adjusting well but is very skittish, they said she is only 3 months old and already weighs 40lbs. She bonded to our dog first, they share the doghouse when outside and even though we have 4 dog beds in our home they sleep in the same one. She seems to be having a hard time trusting people, she squeals anytime anyone but my husband or I get near her and seems to have anxiety when we aren’t around. I’m a stay at home mom so I’m always with her but she panicks if my husband is in the bathroom with the door closed, she will deal out at the bathroom door until he lets her in, she does the same with me. It’s been almost a month now and I worry that the past may never leave her and she may never be able to relax, I also worry about how big she will get, we will keep her no matter what as we already love her but at 3 months and 40lbs I don’t know how big to expect her to get. Thanks so much for this article! I’ve recently gotten my first indoor mini pig and was really struggling tonight over bonding. For every time it seems like he was bonding with there is at least 5 more where I’m convinced he doesn’t care about me at all. He will sleep snuggled up to me (after a lot of squealing from being picked up) and once he willingly got in my lap so hopefully we’re on the right track. It’s very encouraging to hear it may take a while and we’re not failures! We just brought home our mini pig, Taco, 5 days ago. She seems to be adjusting fine, but everything I’ve read with the bonding and training says treats. I feel like we brought home the pickiest eater.. barely eats her pellet fed, veggies, fruit or anything else I’ve tried she wants nothing to do with. Any ideas.. She is 6 weeks old could it be she’s so young? I recently adopted a new mini piggy, and I have been feeling a bit discouraged over the trust that I have gotten thus far. Slowly but surely, she is coming to me more but still won’t allow me to touch her at times! My other family member seems to be having more luck as far as touch goes, but I’m confident that she will warm up slowly but surely. Hearing your experience definetly has brought a piece of mind and heart! Do you have any suggestions as to building a stronger bond? Hi, i just brought home a 12 week old pig last week. She was a house pig until 8 weeks old then put in the garage where she would escape her pen and run free in the yard only returning at dinner time. I know she was socialized at young age but being allowed to run free for 4 weeks has turned her very unsocialized, almost feral. I have her in a pen in the living room and sit with her frequently and she is slowly allowing pets if there is food involved. She seems overweight with a big belly, large jowls and a few wrinkles so i am weary of using treats to much as i dont wont an obese pig. She is a juliana potbelly mix so her size and shape is a little tricky. Im just curious if anyone has had any luck in successfully bonding with a pig that has been almost feral. She is young so i do have hope that it is possible still. Thank you for this information I’m at the point where my micro pig is screaming when we pick her up plus after her having a run around the garden it’s a nightmare to get her back in her cage. So I got my baby Princess Penelope, a juliana about 6 weeks ago when she was already 4 months old. The first 2 weeks I tried picking her up once a day/every other day and she would freak out. I am sure that I am holding her correctly, but now she seems to have become more hesitant at times towards me. I worry that if I continue to try and pick her up her response will be to move away from me to avoid the stress. She let’s me pet her and give her belly rubs but only if we are both sitting on the couch and she knows I won’t try to pick her up. She is 20lbs now, quite strong and fast. My priority is for her to be comfortable and feel safe in her home and around me and not minimize stress. Should I be picking her up every day even though she is scared? She was outside sleeping in a barn with other pigs with minimal time indoors when I got her at 4 months old. Already behind in everything including harness and leash. I got Clyde at 8 weeks he is almost 3. As I typethis he is wrapped up in his favorite cozy blanket napping on the couch beside me. Usually he is sleeping on me but my legs go numb so I have to slip out from under him and sit on the other couch. He is most bonded with me, everytime I go to work and hes home with my husband he knocks over chairs and opens cupboards then as soon as I get home he wants to sleep on my on the couch. I love my pig and wouldnt give him up for anything!! Even though they are a full time job and are just as bad as a naughty 3 year old 24/7. It is definetly a commitment, but worth every second! !